Courtney Ponce and the Inland Insiders highlights and interviews from Kaiser’s win over Ayala in the battle of unbeatens. For lack of better words, it was unbelievable. Los Altos pulled off the upset of the season, shocking back-to-back CIF-Southern Section champion West Covina 17-14 a week after getting embarrassed in a 40-point loss to Diamond Bar. Los Altos kicker Alex Henry, called up to varsity after regular kicker Juan Sanchez left the team to join a soccer academy, booted a 30-yard field goal as time expired to hand the Bulldogs their first loss in the Hacienda League since it was created in 2010. Bishop Amat remains unbeaten: – Bishop Amat High School put the finishing touches on a fantastic nonleague schedule with a workmanlike 31-7 win over visiting Culver City on Friday night. The Lancers improved to 5-0-1 and will have next week off to prepare for Serra League play, where the action begins with a road game against defending league champion Alemany. Charter Oak impressive again: Senior Aaren Vaughns ran for 163 yards and four touchdowns on 17 carries as Charter Oak cruised to a 52-7 win over Los Osos in nonleague play Friday, making for an unhappy homecoming for the Grizzlies. Goss leads way for South Hills: South Hills continued its winning ways as it defeated Glendora 28-17 in a nonleague game Friday at Citrus College. The Huskies were led by a strong passing attack featuring junior Adam Goss, who was 12 of 19 for 164 yards, including touchdowns of 25 and 21 yards to Carlos Delgado and Steven Mendoza, respectively. Damien routed on the road: Los Alamitos (4-1) sent Damien (3-2) into Sierra League play on a sour note by defeating the Spartans 42-7 on Friday at Veterans Stadium. Azusa coach Joe Scherf has won four straight Montview League titles and was a perfect 27-0 in league since taking over in 2008, but Duarte ended that tonight with a 40-14 win over the Aztecs while Gladstone hung on for a 19-13 win over Sierra Vista. Nothing has come easy for the Gladstone High School football team during its undefeated run, surviving a triple-overtime thriller against El Monte a couple weeks back, and coming from behind for the fourth time in five games on Thursday against Sierra Vista, sneaking away with a 19-13 victory at Citrus College. The Dons tried to rally in the final minute, but with the seconds ticking away after a third-down sack on the Gladiators 41, they spiked the ball thinking they had a play left and the Gladiators took over and ran out the clock to improve to 5-0 and 2-0 in the Montview League. The Gladiators looked like they would run away it on the opening drive, quarterback Kevin Amezquita completing his first six passes and scoring on a three-yard touchdown run to go up 8-0. But the Dons came back in the second quarter, quarterback Jonathan Mora completing a five-yard TD pass to Sergio Gonzales to cut it to 8-6 after the missed conversion. After the Gladiators extended it to an 11-6 halftime lead on Eduardo Cortez’s 34-yard field goal as time expired, the Dons chewed up clock in the third quarter and went ahead on Gonzales’ eight-yard TD run to go up 13-11 with 3:55 left in the third. “I just told myself, we have to get that back,” Amezquita said. That’s exactly what the senior did, rushing for 31 yards and later scoring on a 10-yard TD run to go back in front less than two minutes later, giving the Gladiators a 19-13 lead that it wouldn’t surrender. Amezquita completed 12 of 16 passes for 153 yards and rushed for 92 yards and two touchdowns in another complete effort. Sanchez leaned on Amezquita in the fourth quarter, going to him time and time again on options to use up the clock. The Dons’ Lee Jones, the San Gabriel Valley’s leading rusher, was a workhorse finishing with 116 yards on 31 carries before leaving the game for good in the third quarter with cramps. Jose Carillo took over and rushed for 52 yards, but he couldn’t finish either, leaving late in the fourth with an ankle sprain. The Gladiators had their chances, but coach Don LeGro said the mistakes and injuries piled on as they dropped to 3-2 and 1-1. 1978 South Hills grad Lance Easley (26) ruled the controversial Fail Mary a touchdown on Monday that allowed Seattle to beat Green Bay, 14-12. That ruling and the buzz it created helped end the referee lockout on Wednesday. That’s right, you can thank the SGV for bringing the refs back to work. 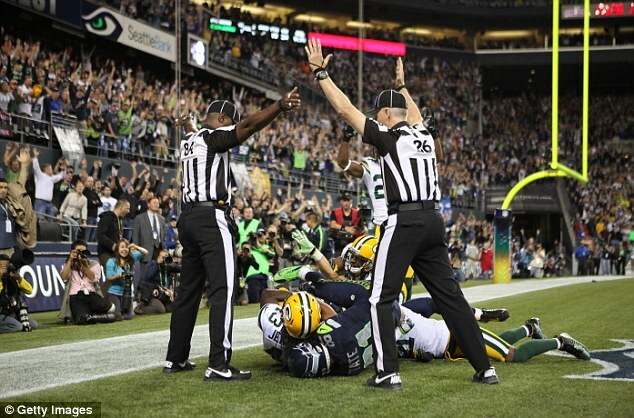 USA TODAY: Small wonder why NFL replacement official Lance Easley is considered public enemy No. 1 this week — and maybe for the entire season in Green Bay, Wis. The annual Orange Crate Trophy match between Damien and Bonita high schools is always an intense match between the cross-town rivals. Unfortunately, a rebuilding Bearcats (2-9) team ran into a solid defense led by All-American goalie Kyle Garwick as the Spartans (5-3) cruised to an 18-5 win Wednesday afternoon at Los Flores Park. Freshman 2-meter man Matt Maier scored with only 25 seconds gone in the game. The Spartans scored five more goals in the quarater as they built a 6-1 lead and never looked back. After five weeks of high school football we’re starting to get a clearer picture in the chase for the San Gabriel Valley Tribune Football player of the year. In no particular order, here are my top eight candidates. Of course, more could emerge when the games get bigger and the dust settles in the CIF playoffs. Above: Gladstone quarterback Kevin Amezquita has been nearly perfect in leading the Gladiators to a 4-0 start. Aaren Vaughns, Charter Oak, RB: The senior has been everything for the Chargers, but has settled in as their primary back, averaging 125 yards with seven touchdowns. He’s also caught 13 passes for 102 yards and had a highlight night against Los Alamitos, rushing for 277 yards and two touchdowns. Koa Haynes, Bishop Amat, QB: Has done everything Amat coaches have asked him to do in compiling an undefeated 4-0-1 record. He’s completed 76 of 108 passes (70 percent) for 1,087 yards and 11 touchdowns while also rushing for 121 yards and three TDs. Not bad considering he’s done it against the area’s top challengers. Kevin Amezquita, Gladstone, QB: Is having an incredible season leading the Gladiators to a perfect 4-0 start and is making them a serious threat to dethrone Azusa, the four-time Montview League champs. Amezquita is doing it with his feet and arms, leading his team in passing and rushing. He’s thrown for 481 yards and six touchdowns while also rushing for 506 yards and seven TDs. Matt Simko, Chino Hills, QB: The Colony transfer has fit right in and performed well against a tough schedule, leading the area in passing with 1,454 yards with 13 TDs to go against just four interceptions. And he’s done it all against super competition. Darren Andrews, Bishop Amat, WR/KR: The run and pass threat has been Amat’s most electrifying player. He has 15 receptions for 301 yards and three TDs. He has eight carries for 98 yards (12.3 average) and is averaging 35 yards on kick returns, including a TD. Jake Payton, San Dimas, RB: The durable back has done it all for the Saints, rushing for 660 yards and an area leading 11 touchdowns. He’s been over 100 yards in every game, rushing for a season-best 166 yards and three touchdowns in their win over Bonita in the Smudge Pot. Jordan Robinson, Ayala, RB: Arguably the area’s best all-around player, he’s been key in leading the Bulldogs’ resurgence from a team that was 3-7 last year to a perfect 4-0 start this season. Robinson is averaging 113 yards with 7 TDs and also has 11 receptions for 190 yards and 2 TDs. Brandon Martinez, El Monte, QB: Despite his teams rough 2-2 start, Martinez has been the straw that stirs the drink for the Lions and can get himself back in the player of the year race by winning the Mission Valley League. He’s passed for 1,306 yards, 11 TDs while also rushing for 273 yards and 4 TDs.